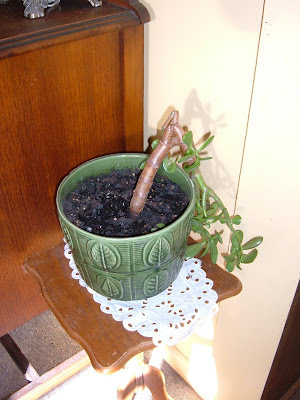 I finally went to the doctors on Monday and with the assistance of medicines I am doing better. Yes, anti-biotics with steroids are kicking the strep throat into submission and causing a bit of a buzz in my head..........needless to say, I am awake a bit longer and knitting so fast I can't see the stitches as they fly from my fingers! 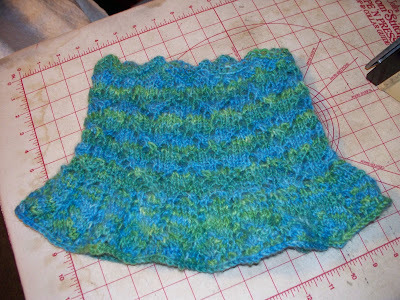 I knit this neck warmer from Knitty Winter 2008, called poinsettia. It will be heading north to an appropriate recipient! 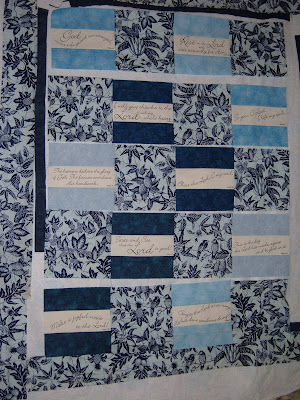 I dug through my stash and compiled this for the next Psalm quilt..told you I needed to make more of these! 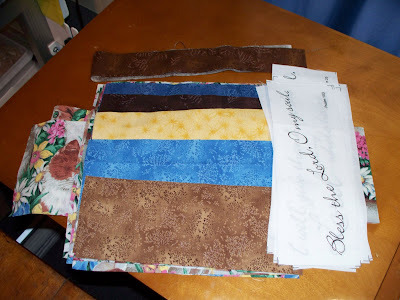 All cut out now and ready to be sewn together-today most likely. I took the leftover yarn from the socks I finished for Marsel and have started a pair for Abigail so we will all have matching ones. 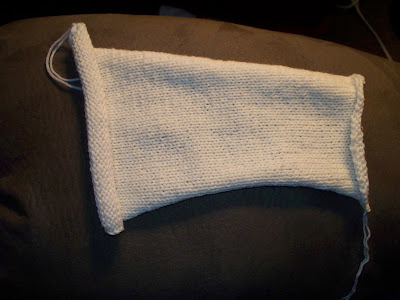 I knit the rest of the KnitPicks bare yarn into another sock blank-this one I will dye in shades of pink and then knit into lacey handwarmers. 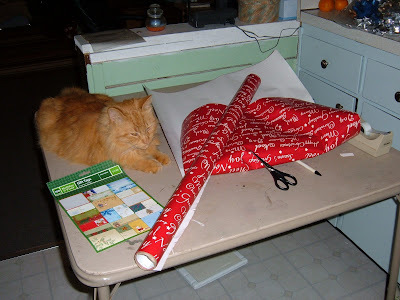 I will explore the Knitty site for a pattern so I can ring in the New Year with yarn in my hands tonight! 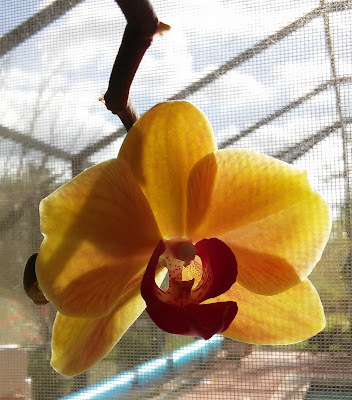 I also got news from the doctor that my mammogram this month is a non-issue...always good news but that the baseline bone scan I had came back with moderate to severe bone loss in my lower spine-- already......at a young 53-I felt this was quite a shock of a diagnosis. Needless to say, I am now adding to my diet Caltrate with D and a weekly dose of Fosomax! I am grateful that there is something I can do to stem the deterioration , grateful the doctor suggested the bone scan now, and trying to get used to the idea. Matthew and Caleb followed us back -had a nice lunch stop a quick pitstop at Caleb's to drop off some of the bounty from his sister and brother-in-law that was in our truck and then on to home! I am still without voice, have a very sore throat and the only thing I do well is sleep so that is what I am going to do! We had a great day of family, food and fun in each other's company. I woke up with sore throat and cold..........kept me kind of slower than usual but it was so therapeutic to sit back and watch all the family dynamics.........I am mute but grateful! 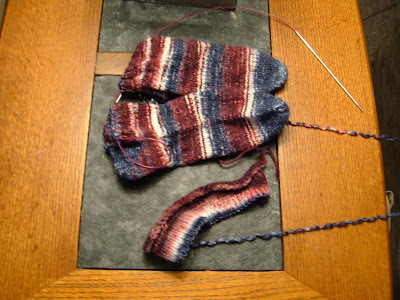 I finished the mittens and additional rows on David's hat. 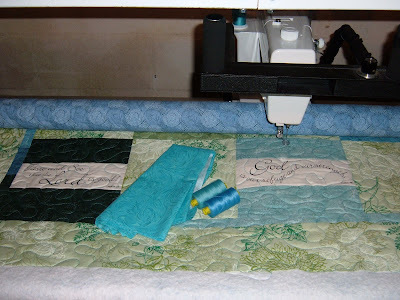 I finished hand sewing the binding on the Psalm quilt for us. Hope you are feeling as blessed as I today. Having fun in Georgia; I am getting a ton of grandkid time! We will be making Christmas cookies this morning! David makes incredible buildings with his legos and such and Abigail keeps us serenaded with piano recitals........its great! I finished the socks I gave Marsel last year to learn how to make socks...........she likes wearing them better than making them! I am happy to accomodate her! 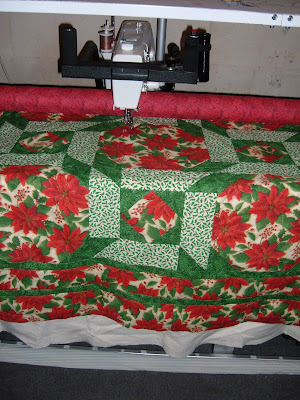 We finshed putting the binding on the quilt, too, by the way! and appropriate accessories! Ah, it is good to be loved. 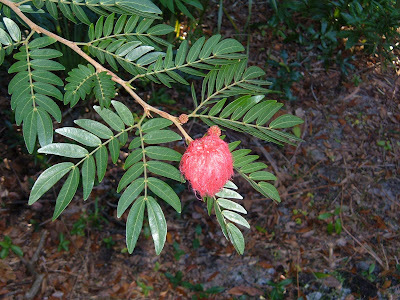 No, the markers for Christmas time is different here in Florida but we are getting better at noticing them and appreciating them. The street lights in the towns nearby still get banners and fancy lights, people decorate their homes with colorful lights and lawn ornaments. 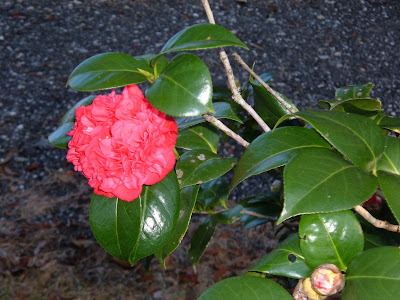 But for me it is the specific flowers and the robins that mark December is here! 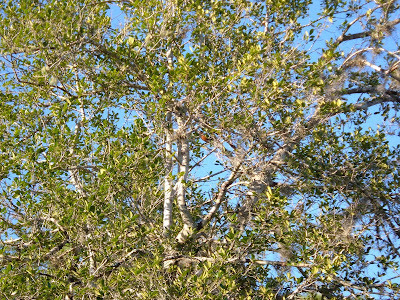 Look at the center of the tree and you will see a red breasted robin. Every time you step out of the house, there is this flurry of birds that you startle. As you hold still for just a few moments they all come rushing back to the ground under one of our berry trees. 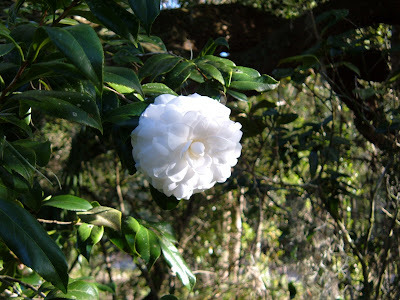 They are abundant under the juniper, camphor and east palatka holly trees. 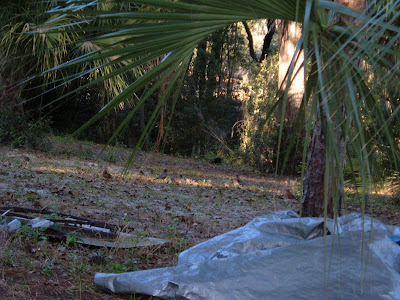 We have several of each in both the front and backyards and it makes our yard the All You Can Eat special! 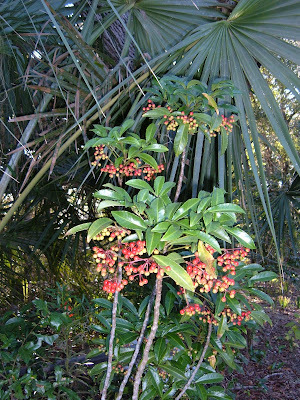 This is a close-up of the camphor tree; see the dark purple berries? 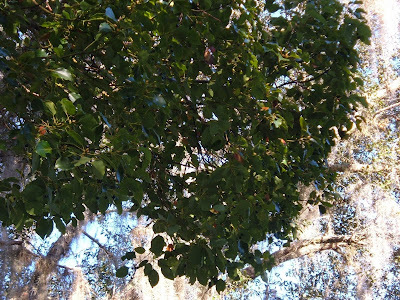 .........the canopy is just a riot of bird movements, chirping and calling. It has a music all its own. but the red is my favorite. 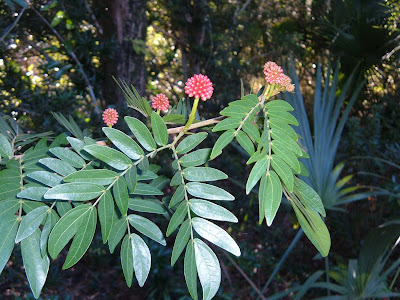 The calliandra is in full bloom........with lots of buds to come. 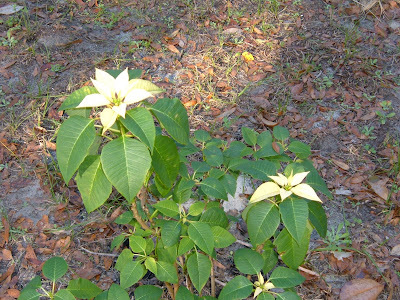 And the national favorite for Christmas is the poinsettia........this one is the one Marsel received for Christmas last year, gave to us and it is doing quite well in the front yard.........it is blooming right on time! 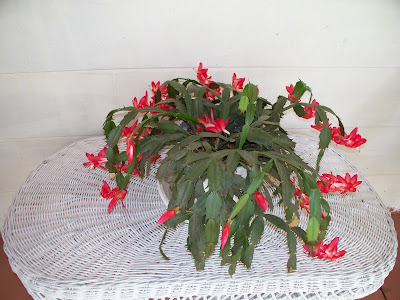 Bill's brother got me this Christmas cactus almost 20 years ago and it has bloomed every year for me! And the Christmas Berry (ardesia) is reddening up quite nicely and will be ready on the 25th and last right into the spring! 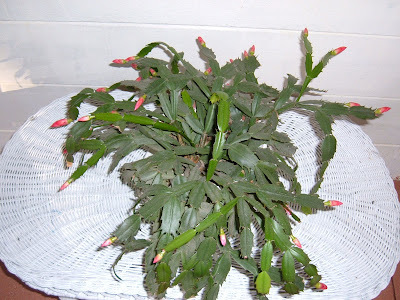 So what plant/flower is the Christmas trigger for you? 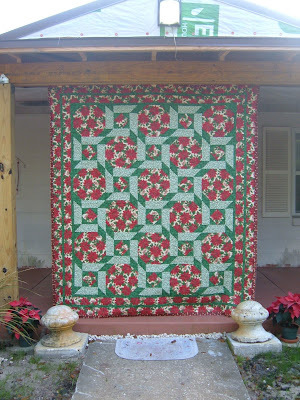 I realized I didn't post a full-sized pic of the mystery Christmas quilt, so here it is. It has been returned to its 'going to GA' pile. I drew the panto for this-a large poinsettia and I moved the panto design back and forth for each row to offset it-a bit of fussing but worth it to get the look I wanted. 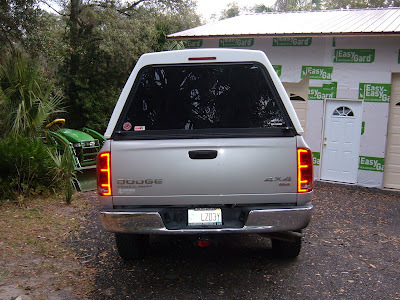 Kind of hard to see but its there! 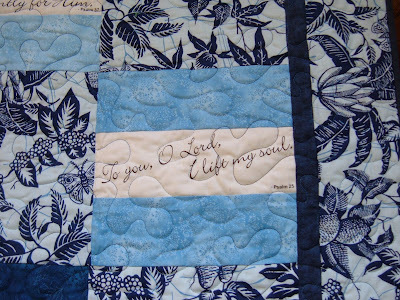 I finished the Psalm quilt and it is now all wrapped to be given tonight. 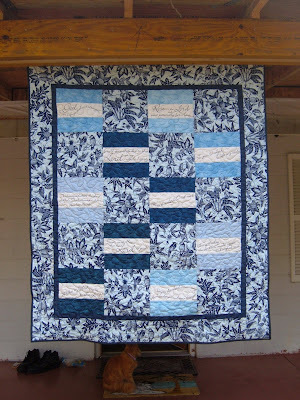 The quilting design is the standard meander design that came with my machine but I increased the size to make a more open design so it wouldn't overwhelm the Scripture blocks. I think I found the right balance. 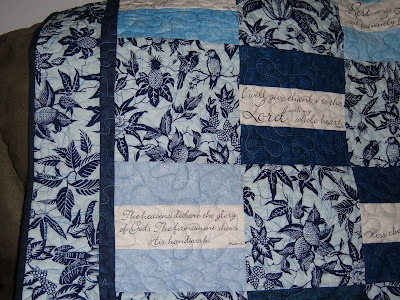 I have the Psalm quilt that I made for us in the 'going to GA' pile so I can finish the binding there, too. This is the sweater I am making myself. It is the recycled homespun yarn that is working up nicely into this perfect weight for FL sweater (we were at 80 degrees yesterday!) It is a freebie pattern from Pamela Wynne called February Lady sweater. 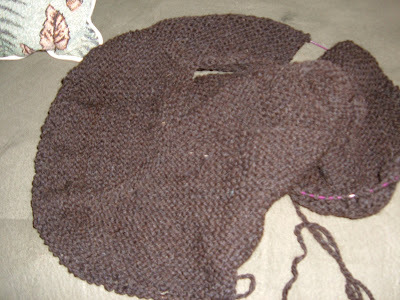 It is a worsted weight yarn on #8 needles knit from the top down so it goes quickly. 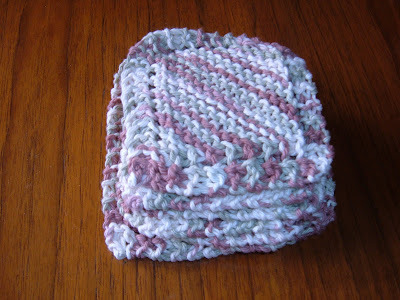 And since the yarn is limited-you can make it as long as you have yarn for-a perfect pattern for this instance! 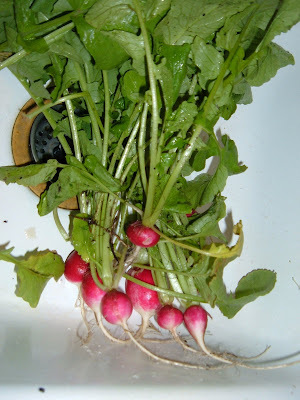 This is a treat from our garden-aren't they beautiful?! We had these for supper last night. 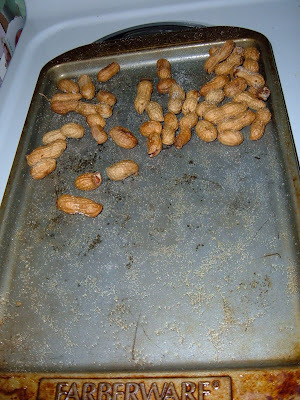 We have also been enjoying this treat in the evening; fresh roasted peanuts. 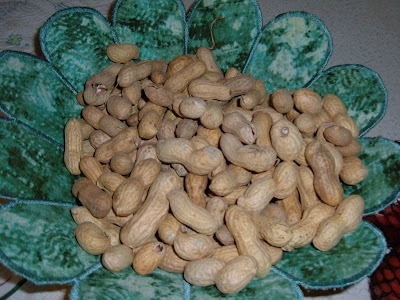 The peanuts raw are delicious and you can understand why they are called a legumes when you eat them raw-they taste just like fresh picked peas. Someone told us about baking them in the shell; tossed in oil and lightly salted. They were incredible! We are taking 5# to GA to share the culinary pleasure! Off to pack up-I will be sharing my daughter's technology to keep you posted. 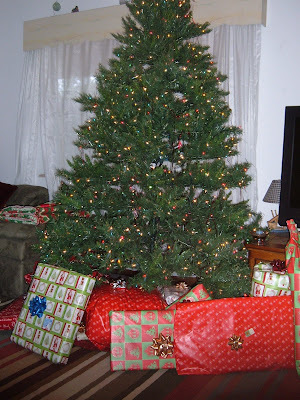 Hope you will have a good Christmas celebration also. I finished the majority of my to-do list today! 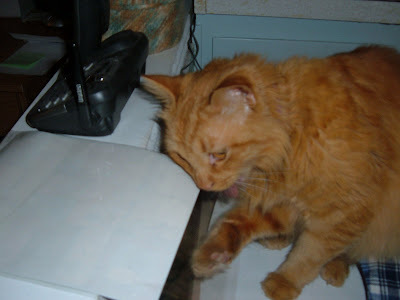 ....the true Bling is evidenced here as he chewed anything that rustles-including the bows which he kidnapped repeatedly! The socks are ready to go to their new owners. 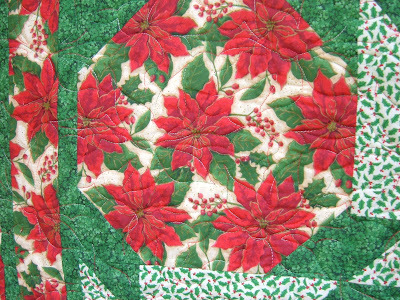 The Christmas quilt is ready to go to Marsel's for the binding to be sewn on-a good time of bonding as we hand sew together! 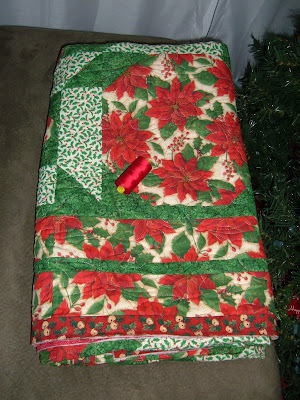 The gift quilt is all ready to be wrapped-the binding is on but I do need to sign it before it goes! I made a batch of coasters for Caleb because he asked for them......when your son wants something handmade-we crafty moms get right to it! This is a nicer gift because the yarn was given to me from Marsel as the colors made me happy! Now the skein has made me happy twice. 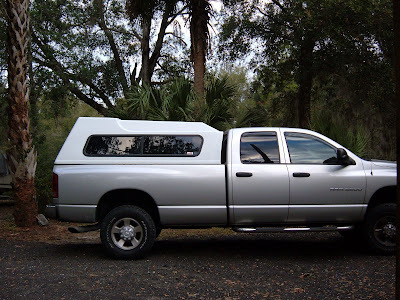 Bill went to pick up his new topper for the truck..........we plan on bringing home a large load from Marsel's at Christmas so we needed to be prepared for any kind of weather. Bill's garden is flourishing. 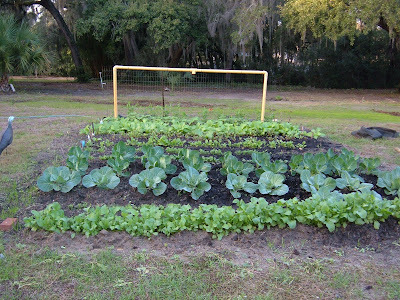 God watered the garden today instead of Bill-we got our first measurable rain in a month! (5/8"). Christmas shopping is 99% finished so all I need to do is inhale and exhale...............and then leave for the visit to GA next week! (There have been many phone calls in answer to our signs about our missing Tom but I will not go again to look-it is just too hard to get disappointed all over again! I am rolling these tablerunners right off the frame. 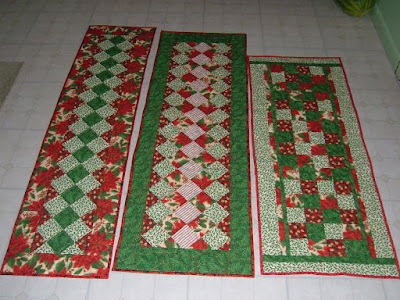 They are the left-over fabric from the mystery Christmas quilt! One is on our table, one is at church and one is in the mail to my daughter-in-law for their new house! A new quilt is on the frame............it takes me so long to decide on a design; still my least favorite part of the whole thing! 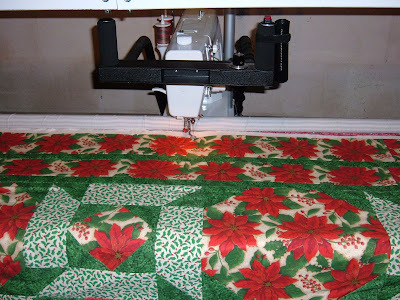 Once I got one drawn (the quilting pattern that is) and figured out how to place it and off set every other row; the quilting itself went well! 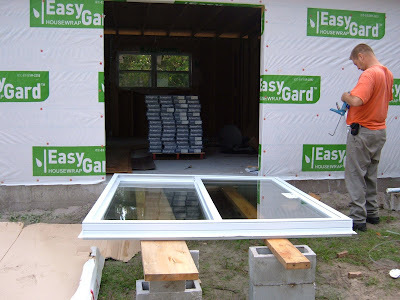 Bill put in the last sliding glass door; this one is to our bedroom to be. 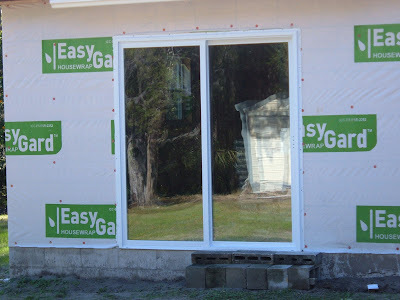 There is a lot of fussiness to centering these things and it doesn't help when the contractors made the opening and inch too high but he persevered and we are now all secured on the south addition. 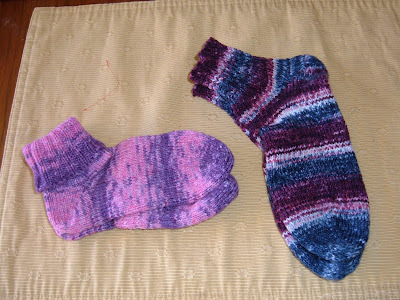 I am flying on the 'flat feet' socks-I had to begin each sock seperately and then nestle them together-couldn't do the beginning in the evening-- I guess it was 'too much, too new ' at that time of the evening! But they are progressing nicely and I will finish them tonight. 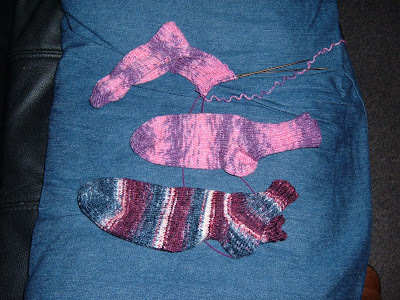 I still like doing socks one at a time because they seem to flow more serenely for me. I take good notes as I knit and so have no problems getting the second one to come out an exact match but it is good to learn something new even if I don't do it this way again (Well, I am going to make up the pair for Abigail but I might not do it 2 at a time!). 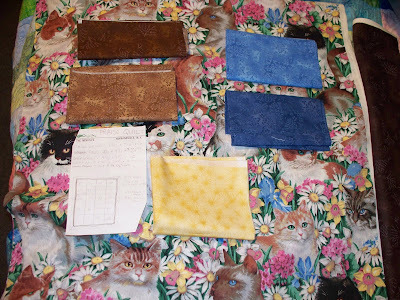 I am going to dye some more sock blanks though! 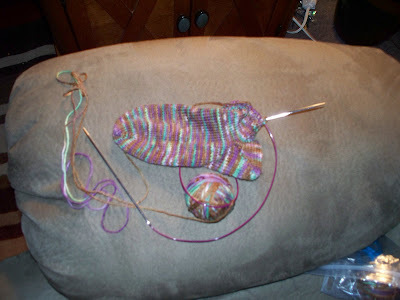 It produces just the control I like for sock design and knitting up the blanks took no time at all.